Everything smells smoky in Dharga Town, Aluthgama, the morning after. 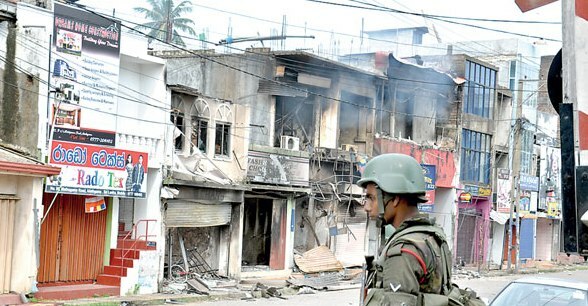 Dozens of Special Task Force personnel stand guard on the edges of the Muslim settlement, separated from the Sinhalese village by a few metres. On doorsteps and street corners, people huddle in little groups, speaking in whispers and shooting wary looks at outsiders flocking to the village at dawn, many of them lugging camera equipment. With the curfew imposed on Sunday night still in effect, life is at a standstill. But in the eerie early morning calm, tension wrought by last night’s mayhem hangs heavily in the air. The charred and still smouldering ruins of a motorbike shop mark the entrance to Dharga Town, where the worst of the sectarian violence that erupted on the streets had unfolded the previous night. “He came here yesterday, that monk – and he said there would be no more Dharga Town,” says N. Yusuf, standing on the one street that cuts straight through the town. He insists the Government should never have allowed the Bodu Bala Sena rally to go ahead in the area, after a traffic accident had made clashes appear imminent only last Thursday. But arrive the monks did, together with a crowd of some 7,000 people, according to Dharga Town residents. Hate speech and fear mongering flowed freely from their stage in Aluthgama, on Sunday afternoon. With Muslim youth congregating in street corners in anticipation of trouble, the stage was set for the bloody night of rioting that was to follow. The first clashes erupted when rally attendees decided to march through the most populous Muslim areas, shouting anti-Muslim slogans and vowing to protect the Sinhala Buddhist nation. To curb the unrest, Police moved swiftly to impose curfew in the division and urge people to stay indoors. But smaller crowds were regrouping, moving separately through different streets of Aluthgama. “Police told us to stay inside, but the crowds were moving about freely outside. The curfew didn’t seem to apply to them, just like the tear gas,” complained M. Farina, a Dharga Town resident. Police units sent in to ‘protect’ Muslim towns and villages. 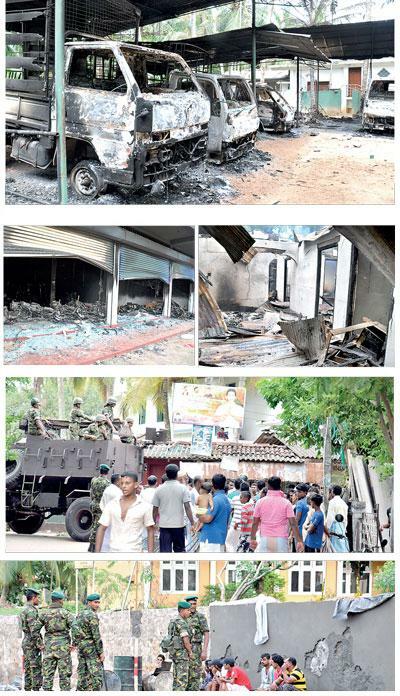 Shops and homes in Dharga Town and on the Welipane Road in Aluthgama town, many of them owned by Muslims were torched and vandalised in the violence that continued throughout the night. In Malawana, in Dharga Town, the Masjidun Noor was vandalised, its windows shattered, holy books burnt and entire sections of the building in ruins. “Only animals attack places of worship, of whatever religion,” spits Mohammed Najid, as he recalls the mosques that have been attacked overnight. In Welipitiya, where residents said three Muslims had died, face-to-face clashes had ensued between the Sinhalese and Muslim groups. Mobs shouting anti-Muslim slogans and hurling petrol bombs and stones advanced on a stretch of the village where the men were standing guard outside the Welipitiya Mosque. “All the women in our village went into the mosque for shelter. We felt we had to fight to protect the women and the mosque if necessary,” said Mohammed Rizkan, who lost his brother-in-law in the Welipitiya clash. The Muslim residents claim for three hours, all attempts to reach the Police and STF had failed, as the violence continued. Fresh blood, remnants of petrol bombs, broken slippers and debris litter the road that Police have cordoned off as a crime scene by morning because of the fatalities. Three men – 30-year-old Mohammed Shiraz, a labourer, 40-year-old Mohammed Sahuran, a local shop owner, and 41-year-old Mohammed Imran, a terrazzo and tile layer – succumbed to their injuries, which residents say were inflicted by gunshot wounds. Imran’s brother, Mohammed Rilwan, says his younger sibling – a father of two – had forged in front of the crowd to protect the women taking shelter inside the Welipitiya Mosque. “He was shot in his stomach and head. It was the Police who took him to hospital in their jeep,” says Rilwan. “They fought us face-to-face for two hours. The Police didn’t show up until after people were dead,” said M. Hussein, a Muslim man involved in the fighting on Sunday night. At least seven people were injured in the fighting. Police teams finally showed up at 1 a.m. to transport the dead and injured, Hussein explained. Seven people had been injured in his village alone. Nearly 10 hours later, Muslim residents in Welipitiya are still criticising the Police, several of whom are now stationed in the village to maintain order. With clashes erupting all over Aluthgama and an adjoining town, the manpower on Sunday night was inadequate, according to Police personnel stationed in the area. “There were incidents taking place simultaneously in different places. We were assaulted by the Buddhist mobs when we attempted to travel towards Muslim settlements – they said we were only interested in protecting the Muslims,” says one senior Police official in Welipitiya, who declined to be named because he was not authorised to make statements to the press. “Here in the Muslim village, we are being accused of failing to show up on time,” the Police officer complains. In the mostly Sinhalese section of the Welipitiya village, residents express sorrow at the situation that has befallen their neighbours. Here, on the other side of the crime scene cordon, both Muslim and Sinhalese owned houses have been damaged by marauding mobs. “We have no grouse with the people on that side of the village. They are our friends. We know them. We didn’t recognise the people who fought last night, they were not from here,” explains L. Lasantha. He says sorrowfully that he knew the people who died in the battles on Sunday night. “This was someone else’s agenda. Our property has been damaged and we have suffered losses. But they were not from among us,” Lasantha says. The same story is echoed down Milton Road, in Dharga Town where several Muslim owned houses and business establishments were set alight. An apparel factory is still smouldering, plumes of smoke spiralling into the air and ash flying in the wind. The flames have engulfed several vehicles in the compound, all of them now in ruin. Across the road, the building that once served as the Wee Tots Montessori, now only a residence, has also been attacked. A garage and fridge repair shop along the narrow street have also been gutted by fire. Muslim and Sinhalese neighbours, seated on plastic chairs in confab on the road, shake their heads about the previous night’s violence. In the absence of a Police presence down the road, they have become an ad hoc neighbourhood watch, led by Police Sergeant and resident, Hubert Silva. “The mob came three times. Twice we beat them back. The third time the crowd was much bigger. And Muslim people gathered nearby angered them by pelting stones. Then there was no stopping them,” recounts Silva. He says there were no faces in the crowd he was able to recognise. Silva begged the mob not to torch the apparel factory, which he said was owned by a ‘good man.’ “I told them the owner employs 10 Sinhalese girls, they would all lose their jobs if the place was destroyed,” he said, adding that the crowds simply told him to get lost. The Police officer assures that there have been no tensions between the Sinhalese and Muslim communities living down Milton Road, a fact corroborated by his Muslim neighbours, now victimised by the looting and torching. “We go to their festivals. We share food. We never had problems here,” says Dayasena, also a resident of Milton Road. The crowd seemed to be made up of hooligans, says Silva, none of them willing to listen to reason. “If there had been two people here in uniform, we could have put up greater resistance. But we were beaten back and we were also afraid,” he says. By 2 p.m. on Monday, the morning calm had been shattered, as crowds armed with poles and other implements gathered once more at the entrance to Dharga Town and close to the Welipane exit off the Southern Expressway. These groups were preventing media personnel from getting into the area, even holding one newspaper journalist hostage for a few minutes. 1,200 Police personnel including 400 from the Special Task Force had been deployed in the town on Sunday to maintain order. Police Spokesman Ajith Rohana claimed yesterday that the situation was being contained, and confirmed that the Army had been deployed in the area to maintain order. The curfew that had been imposed on Sunday evening was never lifted and remained in effect throughout the night on Monday, he said. No arrests have been made so far, despite the widespread rioting and arson attacks, the Police Spokesman said. However, fresh clashes were reported from the area late Monday. Angry crowds of Buddhists prevented an Opposition Parliamentarian convoy from crossing into the town, because of Muslim legislators in their midst, UNP MP Harsha De Silva said. Across Aluthgama, there is a pervasive sense of hopelessness – even among the security forces personnel who explain that they had no choice but to beat back mobs when things got particularly unruly. “There is no one to blame but the Buddhist monks. They led the villagers, they should have known better,” say STF personnel stationed at the entrance to Dharga Town in the early hours of Monday. Much of the morning-after discussion revolves around the question of human rights. This is familiar conversation in the aftermath of tragedy and violation, in besieged towns like Aluthgama and Weliweriya. But for a people whose lives are built on trade, ultimately it comes down to a matter of economics. “They attacked our shops, hitting our stomachs. They finished the Muslims in this area,” an emotional Farina says the morning after violence.She says she watched the special Police observe passively while the Buddhist mob attacked shops and homes.Hubert Silva, the Policeman in Dharga Town, does not believe the violence had anything to do with patriotism or religion. 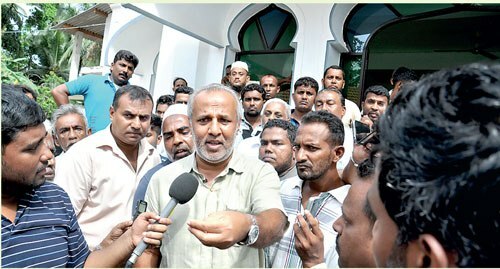 Visibly moved by the scenes in Aluthgama yesterday, Justice Minister Rauff Hakeem stood on the steps of the Welipitiya Mosque and vowed that tough decisions would have to be made. “I am ashamed. I am ashamed that I could not protect my people,” the Sri Lanka Muslim Congress Leader said, in a broken voice, his eyes filling with tears. Hakeem said that for 72 hours, Muslim Ministers and representatives had begged the Government authorities to prevent the Bodu Bala Sena Rally from going ahead. “The law and order machinery completely failed in Aluthgama yesterday,” the Justice Minister said. He said three people had lost their lives in Welipitiya and 78 had been injured in the rioting in the area overnight. “Under these circumstances, I am seriously considering my position. I will have to discuss it with my Parliamentary group and arrive at a decision,” the Minister said, strongly hinting at resignation. Didn’t think violence would ensue: IGP Illangakoon. The Police did not have fears of clashes breaking out as a result of a rally staged by the Bodu Bala Sena in Aluthgama yesterday as they received an assurance everything will be peaceful. Inspector General of Police (IGP) N.K. Illangakoon told reporters in Kalutara yesterday that the Police had received complaints raising fears of violence breaking out if the BBS rally was allowed to go ahead. However, he said after speaking to the organisers of the rally and Muslims in the area, the Police was certain the rally would end peacefully and so there was no need to obtain a court order against the rally. “We were assured that this was going to be purely a religious event and that everything will be calm and peaceful,” he said. The IGP insisted that Police action after clashes broke out had ensured the situation did not escalate further and he also added that eight suspects had been arrested and some were later released on bail. Illangakoon said that the Criminal Investigations Division (CID), Colombo Crimes Division (CCD) and area police were involved in the investigations into the violence.